It’s here again: another stock downturn. But don’t worry, because today I’m going to show you a “1-click” way to profit from it (and collect a nice 6.8% dividend while you do). The key? Dipping into an out-of-favor sector that outperforms when the market gets fearful. 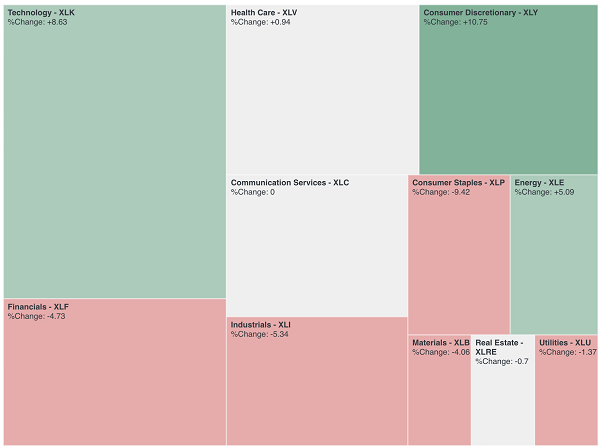 I’m talking about consumer staples, which is down a whopping 9.4% in 2018, far below every other sector in the S&P 500. Usually, when volatility picks up, consumer staples outperform consumer-discretionary stocks. Yet that didn’t happen from February to April, when the market first began to tumble, and it isn’t happening now that the market is beginning to fall again. 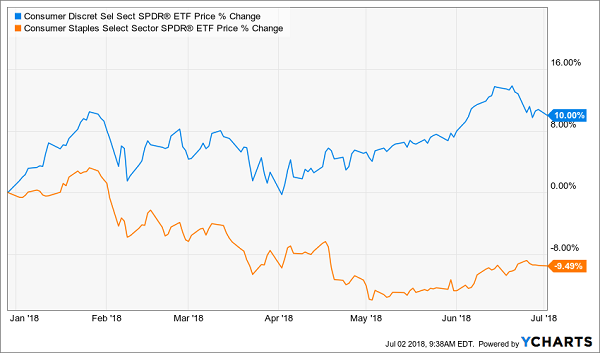 In fact, the Consumer Staples Select Sector SPDR ETF (XLP) has fallen by almost exactly as much as the Consumer Discretionary Select Sector SPDR ETF (XLY) has risen in 2018, suggesting investors are simply selling off the one to buy the other. So where is this market confidence in the relative weakness of staples coming from, if investors are also scared that US stocks are generally riskier than they looked in January? The answer may come down to changing consumer preferences. A big part of the sector is consumer-packaged goods (CPGs), a group that includes everything from Procter & Gamble (PG) to tobacco producer Altria (MO) and well-known brands such as General Mills (GIS). And, taken as a whole, these firms just aren’t selling as much as they used to. 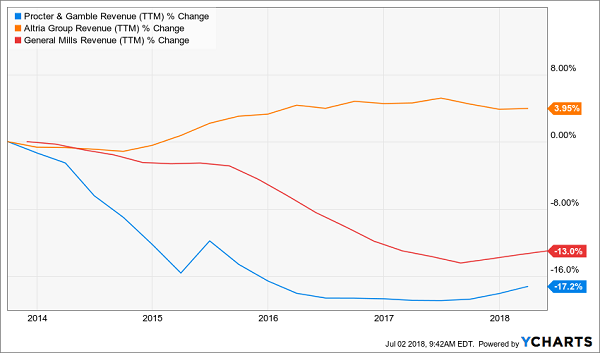 With the exception of Altria, which has benefited from a trend in vaping that’s helped drive tobacco sales higher, these firms’ sales are down, and there’s little evidence they’ll recover. But keep in mind that this trend is well known and is why staples have underperformed consumer-discretionary stocks for years. 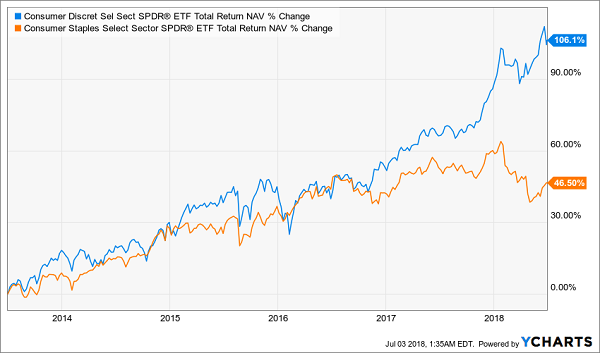 Notice, however, that consumer discretionary’s outperformance has increased significantly in the last few months, which may indicate that the market has oversold the weakness in consumer staples, providing some bargains in the sector. 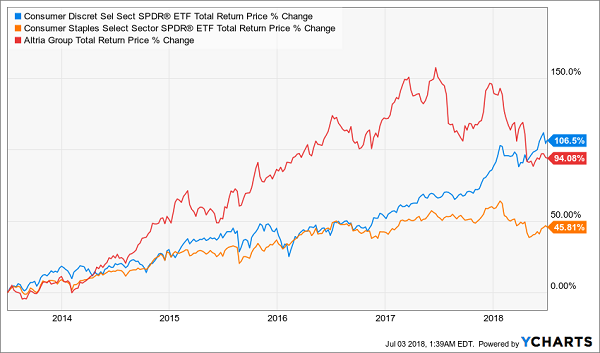 That is why Altria has far exceeded the sector’s performance and even matched the performance of the Consumer Discretionary Select Sector SPDR ETF in the last few years, up until a few months ago. This doesn’t mean that all staples are destined to recover—or even that they will start to tick upward over the long term. As my colleague Brett Owens points out, firms with shrinking sales, like Altria, can’t squeeze out profits forever—but the question to ask yourself is whether some firms’ profit-making abilities have been discounted too much by the accelerated declines in staples stocks in the last few weeks. 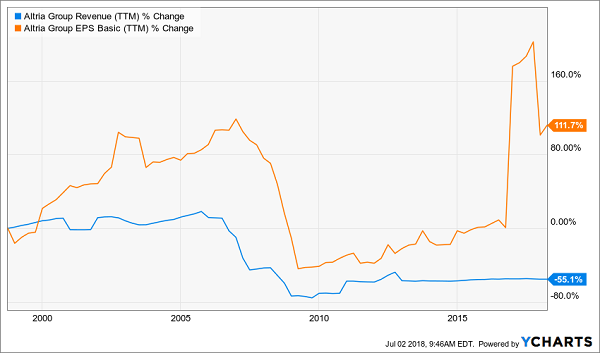 For an investor who can answer this question and find the staples firms that can outperform thanks to higher earnings and exaggerated stock-price declines, the recent extreme selloff in the sector is a rare buying opportunity. But how do you know which staples stocks to buy and which to avoid? Since some staples companies can’t match Altria’s earnings growth, despite falling sales, just buying the index isn’t a way to make this contrarian play. Instead, there is a fund that gives you exposure to the best staples companies while also providing a high yield and strong performance. You get all of this with the Eagle Capital Growth Fund (GRF), a closed-end fund that yields 6.8% (XLP, by the way, yields just 3.7%) and holds many consumer-staples stocks, including Colgate-Palmolive (CL), its top holding, as well as Kraft Heinz (KHC), Procter & Gamble (PG), Pepsi (PEP) and Johnson & Johnson (JNJ). 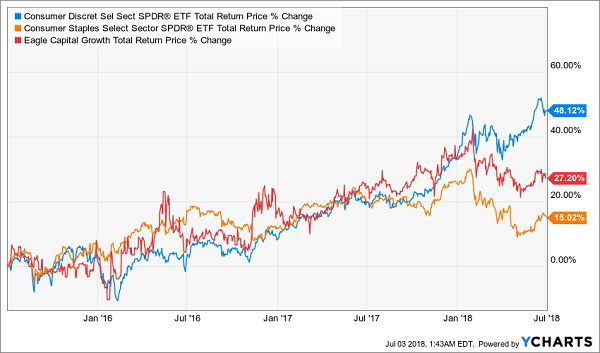 The reason I say now is a buying opportunity is because GRF’s recent decline is largely affected by its staples holdings, while the fund’s other holdings have crushed both the consumer-discretionary ETF and the market more broadly. 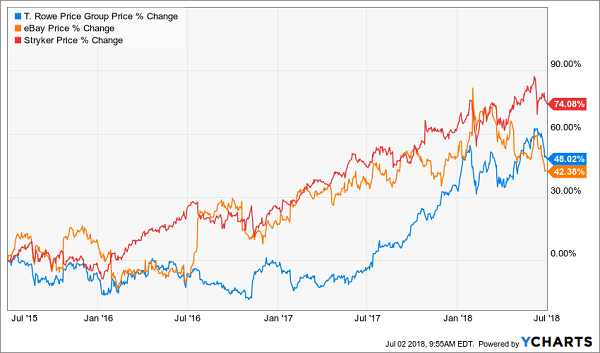 An 18.3% annualized gain over 3 years is impressive enough and shows GRF is a good pick not only for consumer-staples exposure but also for access to a fund-management team that has made great investment decisions in the past. My CEF Insider service holds 15 off-the-radar funds that are my very best buys right now—and I’m ready to share each and every one of them with you today—right now, in fact. Each one of these 15 all-stars is poised for fast double-digit gains. PLUS they throw off SAFE yields up to 9.62%! That upside and dividend income both top anything you’ll see from our GRF pick, plus their incredible diversification—everything from US stocks to real estate investment trusts, high-yield bonds and preferred shares—makes them a lot safer, too. 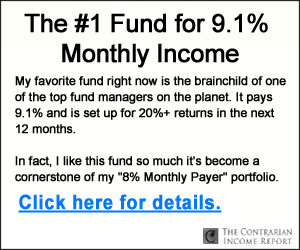 All you have to do is CLICK HERE to road test CEF Insider and get immediate access to this standout portfolio with no risk and no obligation whatsoever. 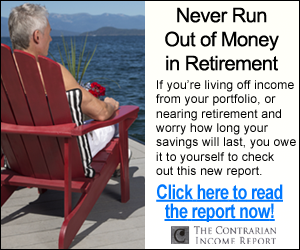 Your no-risk trial comes with my latest FREE Special Report, which reveals my 4 “Best Buy” funds now. These “unicorns” boast 7.1% CASH payouts, on average! AND I’m expecting strong dividend growth here, too, so you’ll be pocketing 10% or more in short order. The kicker? Thanks to their ridiculously cheap discounts, they’re also on the launch pad for 20%+ price gains in the next 12 months (or sooner)! Don’t miss out. CLICK HERE to get instant access to the CEF Insider portfolio and the complete service with no risk whatsoever!